Lung cancer typically occurs in the air passages or areas of air exchange in the lungs. It is typically associated with smoking, but many patients who have lung cancer have never smoked. There are two general types of lung cancers: “small cell” lung cancer, which is almost always associated with smoking, and “non-small cell” lung cancer. According to Mayo Clinic, lung cancer is the leading cause of cancer deaths in the United States. Discover information about lung cancer symptoms, treatment options and more below. Staging of lung cancer involves evaluation of the size of the tumor in the lung and whether the cancer has been spread to lymph nodes or elsewhere in the body. Staging is an important aspect of lung cancer treatment and prognosis. Even if you have ever smoked, it’s important to be aware of lung cancer symptoms. Non-smokers can develop lung cancer from exposure to radon. Oftentimes, individuals do not experience lung cancer symptoms until later stages of the disease. The most common symptom of lung cancer is chest pain. Diagnosing lung cancer will vary from person to person. 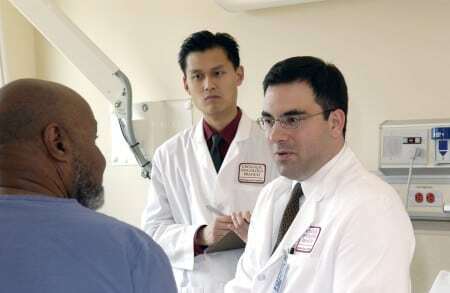 Your doctor will evaluate your medical history and discuss your symptoms. Following a physical exam, imaging tests may be conducted to determine if you have lung cancer. In addition, your doctor may utilize procedures to study the tissue and fluid around the lungs. Lung cancer treatment depends on the stage of the disease, but may include surgery, radiation, chemotherapy, or a combination of these. Earlier stage disease that has not spread to lymph nodes, surgery or focused radiation are the primary options for treatment. When spread has occurred to the lymph nodes in the middle of the chest (mediastinum), typically the treatment involves radiation therapy in combination with chemotherapy. Regardless of the stage, treatment of lung cancer requires a team approach with involvement of radiation oncology, medical oncology, and a thoracic surgeon. Other support including help for patients to stop smoking is important to help patients through treatment of their disease. The physicians with Southeast Radiation Oncology have a true team effort in the approach to treating lung cancer. This includes strong relationships with surgeons and medical oncologists, but also unique expertise in utilizing new technologies such as SBRT, intensity modulated radiation therapy and image-guided radiation therapy. Many of our board-certified physicians have been involved in national research specific to lung cancer, including clinical trials that give our physicians the ability to offer superior care to these patients. To learn more about your lung cancer treatment options, contact us to schedule an appointment at one of our cancer treatment centers in Charlotte, NC and surrounding locations. We are proud to serve the Southeast region of the United States and beyond.